Watch 480*272 AVC videos on your PSP and not enough sources? You have more video choices since you use 4Media DVD to MP4 Converter. 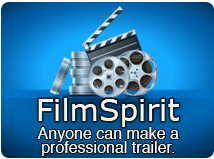 This software can convert DVDs to MP4 compatible with many popular players. 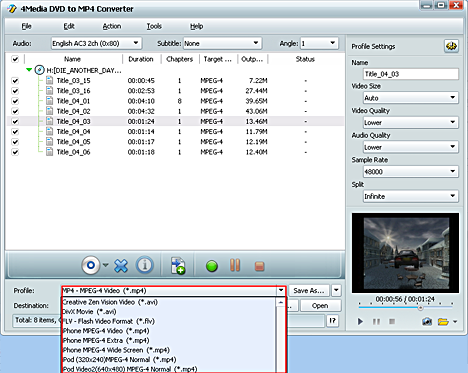 And converting DVD to PSP AVC videos can be easily done with the professional DVD to MP4 converter..
Firstly, free download DVD to MP4 Converter, install and launch it. Then let's start. How to convert DVD to PSP AVC Videos? Click “Open DVD” button or File>Open DVD/IFO Files, select a DVD (or DVD Folder, ISO file, IFO file) in the dialog box that opens, and load it. The Loaded DVD’s information, such as chapter, title, etc., will be shown in the file list. Select one or more files in the list, click Profile drop-down button, select an output format for selected files in the drop down list - you can see AVC Video (480*272) (*.mp4) and PSP AVC Video Format (*.mp4) *(Video size :368*208) provided in the list. Choose the one you want. 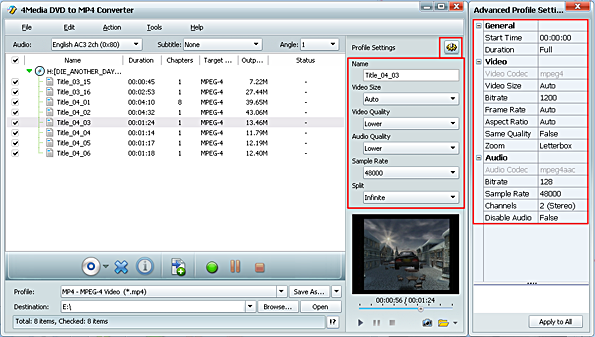 If you are a veteran user, besides the DVD audio, subtitle, and angle, you can further customize the videos by setting output video size, video quality, and channels in Advanced profile setting panel. After finishing the above settings, just click the green "Start Ripping" button on the main interface to start converting. You can view the converting progress in the progress bar at the bottom of the window. And when the "completed" status shows and the conversion finished, you can just click the "open" button to check the converted videos. Put them on your PSP and watch the excellent quality DVD movie on your palm. Free download DVD to MP4 Converter here!